The pressures and concerns of teenagers are at the forefront of their emotional and mental health. This resource provides young men and women with guidance and tools to recognise the importance of social skills to aid their development. The sessions and practical activities will allow students to address issues of identity, self esteem and self awareness based on the author's research and experience. 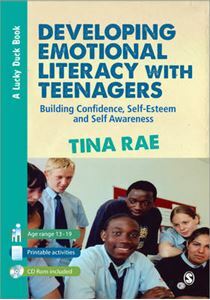 Covering issues including relationships, drugs and problem solving the new edition will also cover: - Gang cultures - Cyber-bullying - Future pressures - Eating disorders This new resource also introduces therapeutic approaches to promote well-being including Cognitive Behaviour Therapy and Motivational Interviewing as well as offering easily accessible worksheets and materials available to download online. Tina Rae has once again devised an innovative and engaging programme. Tina Rae has 25 years experience working with children, adults and families in both clinical and educational contexts within local authorities. She is currently a Professional and Academic tutor on the Doctorate in Child and Educational Psychology at University of East London.